You should know something about me. Once I get my mind set on something, there’s no going back. I have a teeny bit of Scottish heritage in my genes and I think it all manifested as stubbornness. Remember when I said a few weeks ago that I really wanted to make these cute cheesecake tartlets, but my plans were foiled by the lack of proper pans? If you thought that would be the end of it, you don’t know me. I immediately ordered some tartlet pans online and when they showed up, I started baking. These beautiful little tarts were definitely worth the wait. They came together much faster than I expected and they have all the flavor you would expect from a big cheesecake. The cheesecake itself is smooth with a tart hint of lemon, which pairs perfectly with the sweet strawberry glaze and fresh strawberries. Aren’t they cute and impressive looking? 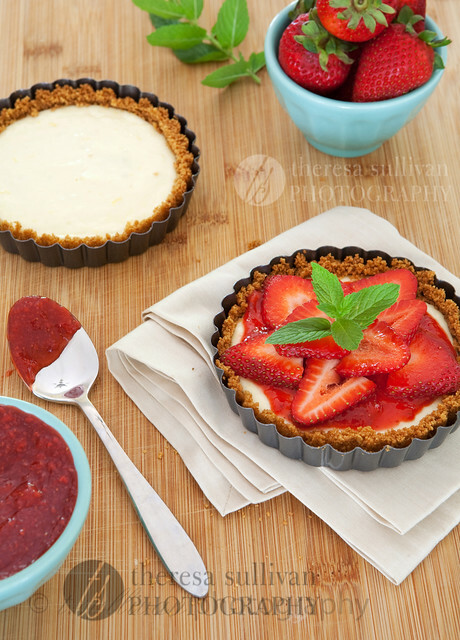 These strawberry cheesecake tartlets would be a great make-ahead dessert for any special occasion or gathering! Preheat oven to 350°F. Set 6 4-inch tart pans with removable bottoms on a baking sheet. If your tart pans aren’t non-stick, give them a spritz of cooking spray. If using whole graham crackers, break them up into large chunks and place them in a food processor. Pulse until you have uniform crumbs. Add melted better to the food processor and pulse a few more times until the texture resembles wet sand. Spoon about 1/4 cup of the graham cracker crumbs into each tart pan, and using your fingers or the back of a measuring cup, press into the bottom and up the sides of each tart pan. In a large bowl of an electric mixer or in the food processor, combine sour cream, cream cheese, lemon zest, lemon juice, vanilla extract, egg, and sugar. Beat on medium high speed (or pulse) until the mixture is smooth. Divide the batter evenly among the prepared tart pans. Bake at 350°F for 15-20 minutes, or until the edges are firm and the centers are still slightly jiggly. Cool to room temperature on a wire rack. To make the topping, puree 6 ounces (about 1 cup) of fresh strawberries in a food processor. Combine with sugar, cornstarch and lemon juice in a small sauce pan and bring to a boil over medium heat, stirring frequently. Cook another 1-2 minutes, or until thick. Remove from heat and cool to room temperature. 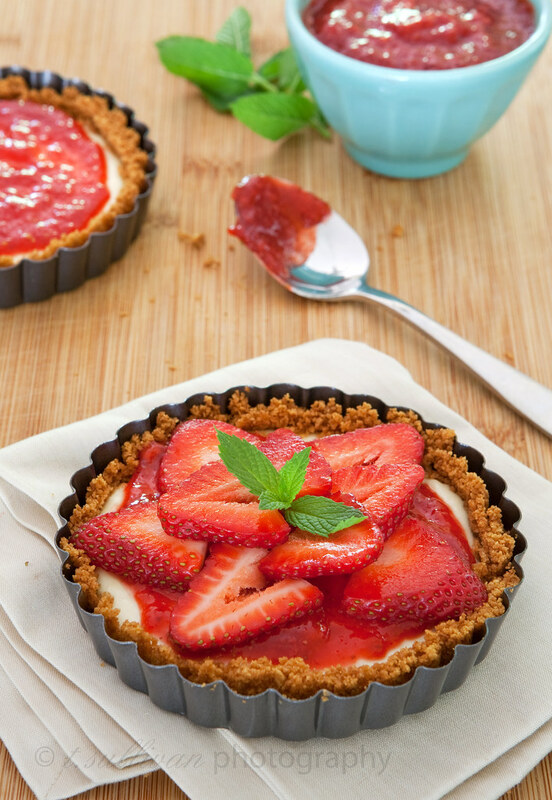 To assemble the tartlets, spread on a spoonful of strawberry glaze over the top, then layer with thinly sliced strawberries. Garnish with a spring of mint (optional). The tartlets look beautiful. The recipe seems easy, can’t wait to try it. I’m so glad you persevered! I’ve got Scottish genes too, and Highland ones at that, so I can relate to sinking teeth in and not letting go … hope to see you again on Nourish Network! I would have done the same thing! A girl after my own heart. These cheesecake tartlets look delicious. And the perfect size for a good healthy snack, don’tcha think? Everything is always more fun when made mini! Your tartlettes look perfect, just like the ones I’m seeing here in Paris. Wow, just like the ones in Paris! That is quite the compliment. Thank you! They look beautiful! I wonder if you could use small aluminum pie pans. I know they wouldn’t look as good, but I’m thinking of making them for a 4th of July barbecue, so they would be more practical. Thanks for sharing your recipe! Thank you for your “Scottish stubbornness” because its product is these delicious looking tarts that my eyes are now feasting on. Yum! This looks delicious, I will definitely have to try out this recipe soon!